I have to say, I think Granny is a very luckily lady.. she is the receiver of much crafty goodness produced by Red Ted and Pip Squeak… and because she is so wonderful about accepting it all, I do like to make her special things with the children too – bring on the Kids Art Advent Calendar – a perfect present kids can make for Christmas (with some help of course) and a lovely way to appreciate their art. 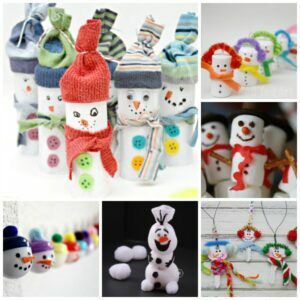 We also rather like an Easy Snowman Craft or two! 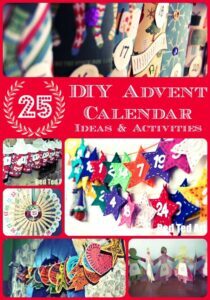 If you are looking for more Advent Calendar Ideas.. look no further! 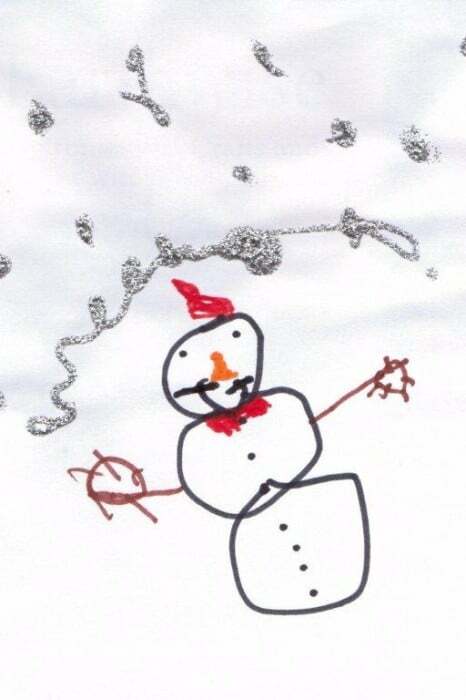 1) Red Ted drew a snowy picture for us – he decided on a snowman and we added some glitter glue snow. 2) Once dry, scan it and resize to A4 if need be. I printed it off on some glossy photo paper. If you haven’t got any, I would recommend printing it on some slightly heavier paper/ light card. 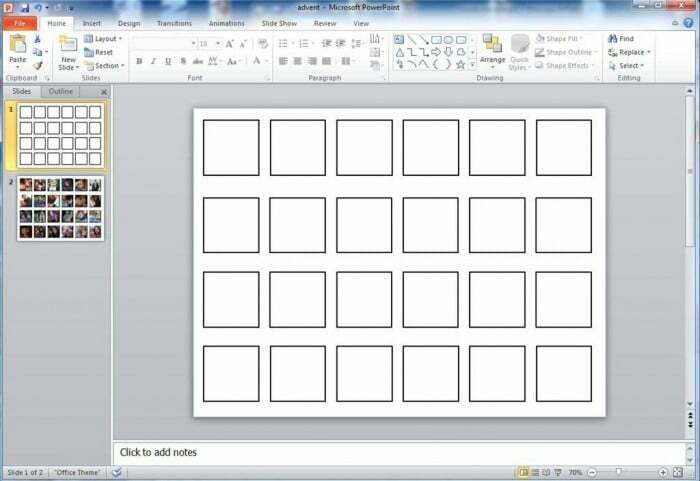 3) Then I made a print out in power point (which I have an advent calendar template pdf -ed for you). 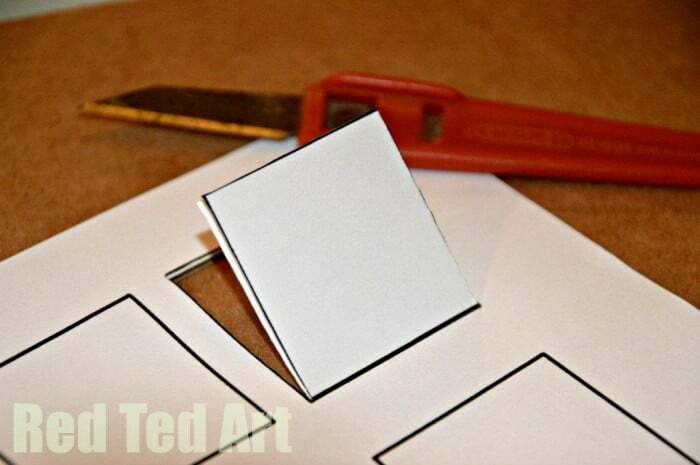 I printed this off and use it as a stencil/ guide to cutting the windows into our pieces of printed art. Remember to only cut 3 sides of your square. I made the right side open one way and the left the other way. 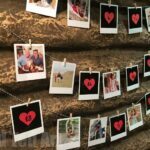 4) Pick out 24 family photos from the year gone by (or alternatively get your children to draw 24 little pictures into your calendar – i think this would only work with older kids, who have the patience.. no way I could have gotten mine to do it!). 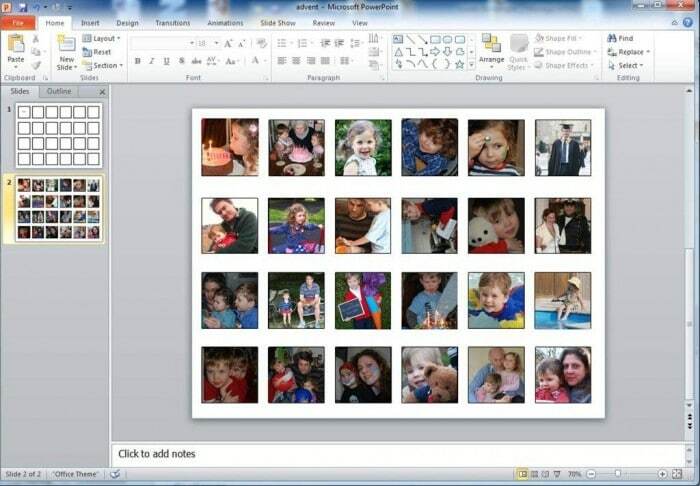 I resized my photos in power point. Then something strange happened, I was going to use the same template again, fill it with photos, print off and place behind our windows. For some reason, I couldn’t print the same stencil off twice accurately. The new prints were slightly bigger. I have no idea why. So I created a lots of small photos in power point, the size of our calendar. Printed them off and stuck them on the paper behind the windows. A little more work, but fine. You will have to see how these print off for you and either you will have a v quick job or you may have a little cutting to do. 5) Once I had stuck all the photos behind the windows. I added a TINY bit of blue tack to help keep the windows shut! We are SO pleased with the results. Red Ted was so excited about seeing his piece of art as a calendar and they loved seeing all the year’s worth of photos! Anyway, I am pretty certain that Granny will be pleased and will love seeing all the different photos! 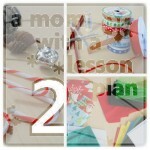 Have you got any presents kids can make to share? 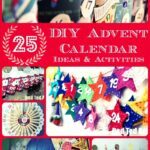 What advent calendar ideas have you got? such a lovely idea for a gift! Granny was super pleased. I know she will enjoy seeing “which photo we picked next”…. 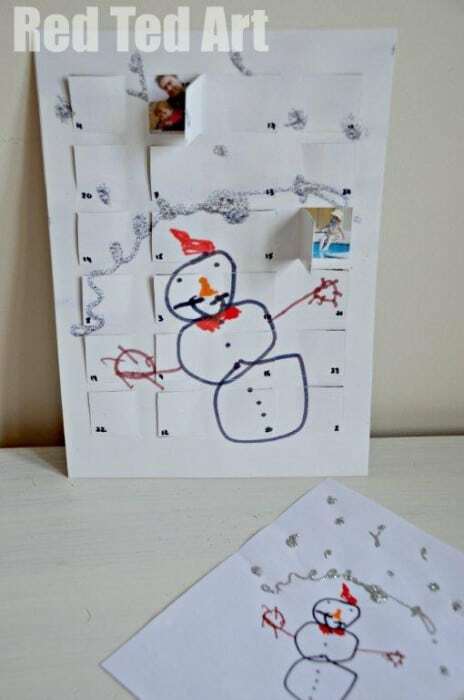 I love your advent calender! I am going to make it priority to make one at the weekend!! Awe that really makes me happy!! YAY! Have fun. This is pretty cute! As an Aunt, I would love my nephews to do this for me! 🙂 yes, wouldn’t that be nice.. you had better send them the link and a big *HINT*! My friend did this for a group of her friends using store bought chocolate advent calendars and replacing the insides with photos of all of us in each window. It was really cute to open a door and see another friend each day. Unfortunately one of my friends who had given up chocolate for advent gave her advent calendar to a small child on a train never knowing what was behind the doors. That kid must have had an odd advent! Oh goodness how funny!!!!! Love that! 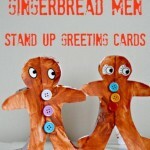 What a great craft idea! 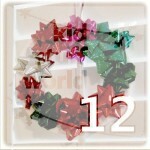 My kids love Advent Calendars and last year we waited too long to buy one and couldn’t find any. What fun to see all the photos from the year! Yes! This perfect for when you missed out on the Advent Calendars in the shops!! Definitely!!! That’s such a clever idea, better get making one sharpish. What a great idea! 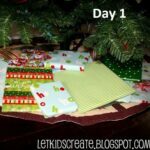 I love the idea of kids creating an Advent calendar as a gift. 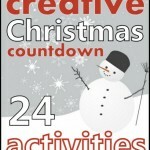 I was happy to feature your post and photo in my 40+ Christmas Countdown Activities post. My husband made this delightful calendar for my mom and mailed it off over the weekend. She was so excited to receive it, and can’t wait for December 1. Thanks for a terrific idea. Awe I so happy he made one!! HURRAY!! This is THE sweetest idea ever! Featuring it tomorrow on the Sunday Showcase! LOVE! Awe thank you, so pleased you like it!! 🙂 and thank you for the feature! I know a Granny or two who would love this! Thanks for linking to Festive Friday, this is a lovely addition! This is just the best idea! I know a grandma and granddad who will be so touched to have one of these from their grandson. Thank you so much for sharing this idea. I know it is a quarter through the month already but my parents would love to receive one of these anytime! Going to go start on it now! Happy Holidays!